Lufthansa provides a comfortable first class experience with superb food and drink and excellent service aboard the A340-600. First Class service starts on the ground with spectacular lounges in Frankfurt. Leave time for a visit to the First Class Terminal or one of the first class lounges (A or B gates in Terminal 1) before your flight. It is an essential part of the first class experience. When time to board your flight, you will be chauffeured in a Mercedes Benz or Porsche from the lounge directly to your aircraft, which is always a highlight of flying first class on Lufthansa. It had been 10 years since I had flown the A340-600 in first class which made the flight all the more exciting for me. From the car, I was escorted upstairs and directly onto the aircraft. A flight attendant waiting at the door welcomed me onboard and showed me to my seat, 2K. Lufthansa A340-600 seating in first class is identical to the A380, with two rows of 1-2-1 seating for a total of eight seats. Some complain the Lufthansa First Class seats are not private enough, but privacy dividers can be raised which essentially block out the people around you. In a compartment under the left armrest you will find the seats controls. Under the right armrest, you will find your IFE remote. There’s two power ports and a USB port on the right arm of the seat and plenty of storage via two compartments along the window as well as a large ottoman that opens up to store all your essential person items. You’ll find a reading lamp above your seat and also one attached to your headrest that is controlled by a button directly on it. You’ll see that unlike the A380 or 747-8, which have a galley between first and business class, business class is directly behind first class on the A340-600. After the meal service I asked a flight attendant to prepare my bed. Lufthansa’s bedding is excellent and I enjoyed a nice 4.5 hour nap during the flight. I was welcomed onboard with a glass of champagne and a bowl of mixed nuts. Lufthansa rotates between mixed nuts and purely macadamia nuts in first class. I also received a hot towel. 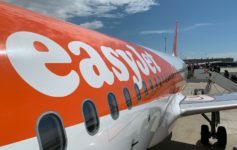 The purser introduced himself to each passenger prior to takeoff and handed out both the drink and food menu for the flight. He wrote the name of each passenger on the drink menu, which was a nice personal touch. A formal meal service commenced after takeoff, though a FA reminded me that I could eat “whatever I wanted, whenever I wanted” during the flight. I’ve used on-demand dining on prior flights to sleep first, but started this flight with an elaborate lunch. Shortly after takeoff, FAs presented an amuse-bouche to each passenger. Today’s selection was a scallop served cold with pickled vegetables. As flight attendants set the table for lunch, I surveyed the menu. I always expect a culinary feast on Lufthansa, but I have had mixed success in finding tasty main courses (beef is always overcooked). Consequently, I have been sticking to fish on recent flights and chose the dish again today. I chose a pretzel roll and garlic bread from the bread basket, which were served with decadent olive oil + balsamic vinegar and “first class” stamped butter. You can always tell if you have a good crew by whether they arrange the S&P shakers with the Lufthansa logo facing you. That’s attention to detail. Every Lufthansa First Class flight begins with caviar service, an acquired taste that I now really look forward to. Caviar is one of those things that is tasty but that I simply cannot justify on the ground, so I get my “caviar fix” only when flying first class. The caviar is served with toast and a garnish of chopped hardboiled eggs, cheese, onions, and sour cream. Next came an appetizer tray, which included veal, salmon, and gorgonzola cheese. I ordered this mainly for the photo opportunity and promptly moved onto a mixed green salad. I loved the sun-dried tomatoes. A pear sorbet was proactively offered as a palate cleanser prior to the main course. Finally, the main course arrived; Skrei (Atlantic Cod) with chorizo and spinach risotto. The portion was rather small and frankly the fish and risotto I had on United a couple days earlier was better, but it was still very tasty. I loved the cream gravy and the sliced chorizo presented a nice contrast of flavors. I enjoyed a nice glass of Riesling with my fish. The meal service continued with a beautiful cheese course. Usually, flight attendants will wheel a cheese cart through the cabin allowing you to pick and choose the cheese and crackers you desire. On this flight, I was presented a sample of each cheese type and each cracker without asking. Cheese is another thing, in my American diet, that I rarely eat as a separate course. Still, I quite enjoyed every one of the cheeses on the plate. Dessert arrived; warm baked apple crumble served with ice cream and a superb cappuccino. And as if we needed anything else, chocolate truffles as well. Two hours prior to landing, I ordered a snack…which turned out to be the highlight of the flight. While I never expected to see a cheeseburger served in first class on Lufthansa, what a tremendous cheeseburger it was. It was so good I dedicated a separate post to it. Flight attendants again set the table prior to serving it. The cheeseburger contained a succulent beef patty with melted cheddar cheese, mushrooms, and guacamole. Vegetable chips (crisps) were served on the side and I also ordered a green salad served with an interesting walnut dressing. And of course fresh-squeezed orange juice, a drink I enjoy more than even champagne on Lufthansa. There were more tantalizing dessert choices, but I just ordered a small bowl of raspberries and another cappuccino. Overall, the meals were excellent on this flight…I truly enjoyed both meals. Lufthansa First Class passengers receive slippers, pajamas, and an amenity kit. After boarding, a FA asked me what size I wanted. Unlike in Air France first class, large is actually large (versus small…). The van Laack pajamas are currently brown in color. The slippers are super comfortable and also merited a dedicated post. Rimowa amenity kits remain out of the rotation, which is disappointing, but the amenity kits are still stocked with La Prairie skincare products. You’ll also find socks, a shoehorn, comb, an eyeshade, toothbrush, toothpaste, and earplugs in the amenity kit, currently by Windsor. Two lavatories in first class offer plenty of space to move around and a window to look out. I appreciate all the amenities available in the lavatory including mouthwash, Evian facial spray, shaving kits, and La Praire hand cream. Unlike the A380, the A340 does not have real towels, which detracts from the first class experience. If you’re flying economy class on this plane, the lavatories are downstairs in the rear of the aircraft…I think that is such a cool feature of this plane. First class passengers receive complimentary wi-fi onboard. My computer kept logging me out, but I was able to re-connect by inputing the one-time code again. Internet worked fairly well in the first couple hours of thee flight, but then stopped working for the remainder…I was not able to do anything other than send and receive iMessages. Over 200 movies are available as well live TV (only one sports channel), TV shows, games, and music. I watched the latest Mission Impossible installment, which was…predictably ok.
Lufthansa uses noise-noise cancelling headphones from Bose. I’ve never had a flight with bad service on Lufthansa, but was very especially pleased with the service onboard. The crew was lovely and engaging. I always appreciate that the purser thanks passengers before takeoff and landing and the two FAs working first class were the perfect blend of kind and professional. On this flight, the captain did not come out and greet each first class passenger prior to takeoff, something that while not a big deal is always a nice touch and was missed here. Here’s some additional pictures I took out the window during the flight. The highlight was the picture of Iceland below. Look at how cold and desolate that looks, even though you can see KEF airport. One of the FA told me it was thee first time she had clearly seen the terrain in Iceland in many years. We arrived into San Francisco 30 minutes ahead of schedule and I was sorry to exit the aircraft. 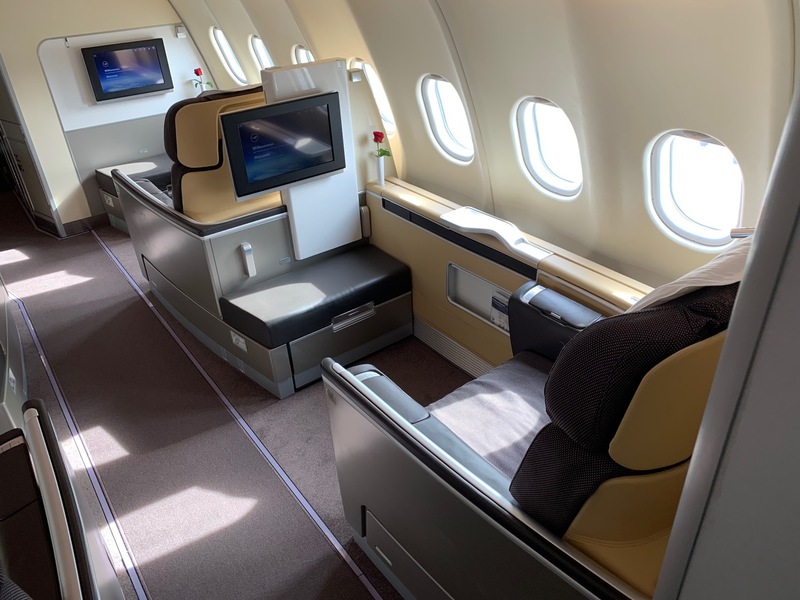 As far as I am concerned, you simply cannot go wrong with Lufthansa First Class and it continues to represent the most attainable aspirational first class experience with frequent flyer miles. Personally, I find the A380 a better first class experience than the A340 (due to the larger lavatories and real towels), but the A340 was very quiet…unlike the 747-8. The bottom line is this: you’re in for a treat if you fly in Lufthansa First Class. Even dozens of flights later, I always look forward to flying Lufthansa First Class. That “desolate airstrip” in Iceland actually is KEF, on the Rekjanes peninsula. We can even see the outskirts of Reykjavik on the upper right hand side of your pictures. I know I might get some heat from your LA-based readers (like myself) on this, but here goes. If you’re ever in the mood for caviar, the fountain bar that sits along the center park/fountain area at the Grove (I know, I know…) has a very decent caviar offering. It’s not fancy, but it works. You get creme fraice, blinis, shallot, boiled egg, etc… and EXCELLENT people watching. It’s a nice way to spend an afternoon. Matthew, super review. IMO you are the high standard of travel blogging. I hope you know that you are really good at this stuff. I do hope your businesses are as successful as your blogging – somehow I believe that is probably the case. Many thanks from one of your readers. Very kind of you say. Thanks Mike! The olive oil onboard was cold-pressed extra virgin olive oil from Modena with low acidity that had a perfect flavor. Like coffee or wine, what constitutes great flavor is a somewhat subjective measure. I called it decadent because that word is a contronym in the English language. One of its meanings is rich and delicious. The pear sorbet was served “proactively” because I never requested it…the FA simply brought it over after my salad. The burger and salad alone look better than anything I have seen from one of the large carriers in a long while. Sometimes that’s exactly what you want, a decent cheeseburger rather than the usual over cooked steak. Does the inflight wifi censor websites ? And does express vpn work? I did not try connecting to my VPN. Thanks for the thorough review. Small spelling error – palate, not palette. Well done. Review at least a couple of flights in a month and you will replace lucky for trip reviews. Oh, Matthew! What a story. The photos of Iceland brought back so many memories for me …. including many an afternoon spent at Blue Lagoon. Thanks for a great trip down memory lane! Great story, I must admit. But let me compare with my competitive experience of flying First Class with EK 225, seat 1K, A380 Dubai to San Francisco on Feb 9th – a 16h flight. While Emirates has no chauffeur service to the plane, there is simply no need as boarding gate A12 has direct access from the first class lounge in terminal A to the plane. The privacy offered by the suite in Emirates First Class is second to none, I suggest. One thing which really impressed me was the choice of high end spirits and wine selection on board. The choice by also accessing the business class bar allows to combine privacy with nice chats in a more busy environment, talking to fellow travelers.